To let the privileged experience how homeless people feel during the winter, non-profit organization fiftyfifty turned the temperature down in cinemas across Germany. Powerful piece, part of the NSPCC don’t wait until your certain campaig. Great use of their research to create a compelling piece. 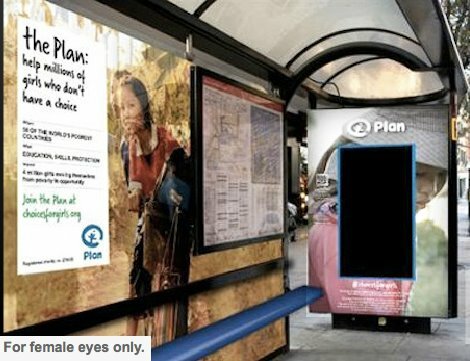 Plan UK is running an interactive outdoor campaign that contains content only women can view. The bus shelter ad uses facial recognition software with an HD camera to determine whether a man or woman is standing in front of the screen (claims the technology is 90% accurate), and shows different content accordingly. Men are denied the choice to view the full 40-second ad in order to highlight the fact that women and girls across the world are denied choices and opportunities on a daily basis due to poverty and discrimination.